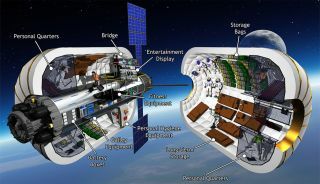 This cutaway shows a concept B330 space habitat for astronauts designed by Bigelow Aerospace. The private spaceflight company has teamed up with launch provider United Launch Alliance to put a huge private space habitat in orbit by 2020. Two aerospace companies are teaming up to launch giant space habitats to orbit, with the first such liftoff targeted for 2020. Bigelow Aerospace will loft its giant, expandable B330 modules — each of which will provide one-third as much usable volume as the entire International Space Station (ISS) — aboard United Launch Alliance (ULA) Atlas V rockets, representatives from both companies announced today (April 11). Two B330s should be ready to go by 2020, and the goal is to launch at least one of the modules that year. The first B330 would ideally be attached to the ISS, which would require NASA's approval, said Bigelow Aerospace founder and president Robert Bigelow. But the module could also operate on its own, flying freely in space, he added. "Each [B330] is able to be its own space station," Bigelow said during a press briefing today at the 32nd Space Symposium in Colorado Springs, Colorado. "They need no other habitats, modules or anything of the sort." This United Launch Alliance diagram shows how the launch provider's Atlas V rocket will carry a Bigelow Aerospace B330 expandable habitat module into orbit. The private space habitat is slated to launch in 2020 under a deal between the two companies. This first orbiting B330 — which is so named because it contains 330 cubic meters, or about 11,650 cubic feet, of internal volume — could house visiting space tourists and accommodate a variety of scientific experiments, Bigelow said. Indeed, it's likely that these modules will serve multiple purposes and customers, operating on a time-share basis. "We're offering discrete quantities of time — a matter of one or two weeks to maybe 45 days — to various kinds of clientele, and also certain areas onboard the spacecraft that we have permission for that clientele to locate packages and experiments that was the motivation for them to be there," Bigelow said. Bigelow and ULA president and CEO Tory Bruno see their companies' partnership as a watershed moment for humanity's exploration and exploitation of space. The first B330s should allow for greatly expanded opportunities for researchers, companies and space tourists in low Earth orbit, they said, and the modules could eventually allow for human habitation on and around the moon, and even as far away as Mars. "We are standing on the very threshold of an expanded and permanent human presence beyond our planet," Bruno said at today's briefing. "This is a very bright future, and you and I right now are standing here, looking right into it." Bigelow Aerospace founder Robert Bigelow speaks with reporters on April 11, 2016 during the announcement of a partnership with United Launch Alliance to launch an expandable space habitat for astronauts by 2020. Las Vegas-based Bigelow Aerospace specializes in building habitats that launch in a compressed configuration and expand greatly once they reach space. Such expandable modules offer much more usable volume per unit launch mass than do traditional rigid structures. Bigelow has already flown three expandable modules in space — the free-flying Genesis 1 and Genesis 2 prototypes, which launched in 2006 and 2007, respectively, and the Bigelow Expandable Activity Module, which just arrived at the ISS aboard SpaceX's Dragon cargo capsule this weekend. The goal of BEAM — which offers just 5 percent the volume of a B330 — is to prove out expandable technology for human use on orbit. It will stay attached to the ISS for the next two years. The partnership between Bigelow and ULA is very much a work in progress, and there's still a lot to work out in terms of how the launch of the first B330 (and any others that follow) will be funded, Bruno and Bigelow said. NASA might end up paying for the first launch if the B330 goes to the ISS, Bruno said. But he stressed that other opportunities could present themselves as well. "It's premature to talk in specifics about these kinds of things," Bigelow said.